February was—as GOP front-runner Donald Trump would say—absolutely yuuuge for presidential politics thanks to several state primaries and caucuses. With that in mind, Trump had a big month on Facebook, but not nearly as big as Democrat Bernie Sanders, who happened to notch a much-needed upset victory Tuesday night in Michigan. For weeks, pundits have speculated that Sanders outperforms rival Democrat Hillary Clinton in terms of having a passionate following. This idea seems more obvious than before if you look at each candidate's ability to inspire text-based chatter in the charts below in which circles of various sizes represent how much a subject grew during the month. For instance, on Facebook in February, Sanders topped even the phrase "Super Bowl" and was second only to "Valentine's Day" in terms of how much the topics blew up since January. Clinton didn't generate growth rate high enough to make it into the top five people in Hot Topics. So maybe Tuesday night's results in Michigan shouldn't have been such a shocker, as Sanders' chatter swelled leading into March. 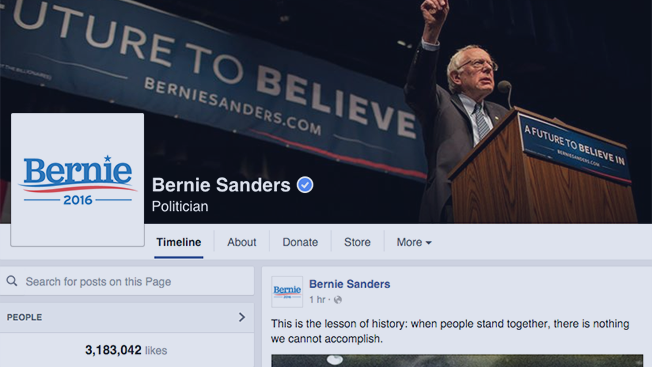 Clinton has roughly 2.8 million Facebook fans, moderately trailing Sanders' 3.2 million. Therefore, the difference in buzz seems to center on Sanders' fans outadvocating Clinton's, keeping his hopes alive one post at a time. Though a Facebook rep noted: "This data is reflective of the overall conversation on Facebook—it does not differentiate between positive or negative sentiment—so in no way is it predictive of future events." It's also intriguing that Sanders—who reportedly resonates with millennials—is generating that kind of buzz on Facebook, a platform known for attracting Gen Xers and baby boomers. Meanwhile, Sanders and Clinton both register on the Instagram chart, which, like the Facebook graphic, also presents the candidates' month-over-month growth for text-based chatter. Check out the full report from Facebook IQ. Its Hot Topics series lets marketers see what digital conversations they may have missed last month and how they might generate more engagement of their own in the future. In addition to the Sanders camp, Super Bowl advertisers such as Doritos and Budweiser should be generally pleased by what they see.